1. How to test for potential incompatibility issues? 2. Why do I need to verify my purchase? 3. Where's my Purchase Code? We often ask our customers to test compatibility on their site, as in many cases a 3rd party plugin or the theme can cause issues, especially regarding appearance. Hopefully, there is an easy and quick way to do it. By temporarily disabling every other plugin (except ours) and switching to the default WP theme you can immediately rule out any chance of incompatibility. If this does not help, the issue you're experiencing is likely not related to other plugins/themes. However, if it does help, you are certainly ran into a compatibility issue. In that case, you can find out what's causing the trouble by re-enabling your plugins one at a time and watching when the issue returns. If you've successfully identified the troublesome item on your site, make sure to share your findings with us, as it can be extremely helpful to fully understand the situation you're in and provide advices and workaround to solve the issue you experience. You can find your Purchase Code in the email received upon the purchase. You can also download your license certificate from CodeCanyon at any time. 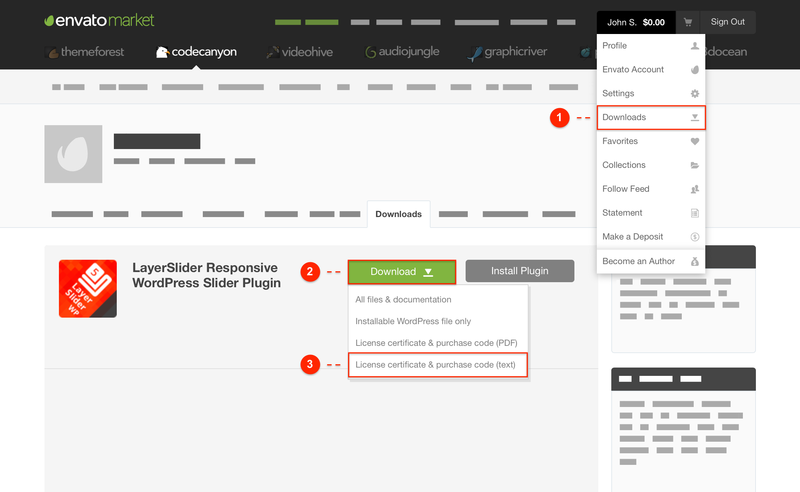 Just navigate to your Downloads page, then find LayerSlider and choose the License certificate & purchase code option from Download button. Your Purchase Code is inside the downloaded text file. How many sites/projects can I use a license with? Each license is valid for one End Product. An End Product can be a website, template, domain or a client. You must purchase separate licenses if you have multiple websites or clients. However, we're checking the domain name where you would like to activate LayerSlider and allow up to 3 additional activations in case of a development environment. To see how development sites are recognized, please refer to this section of our online documentation. Can I use a license for multiple subdomains or WordPress Multisite? You can not. Subdomains and individual sites in a WP Multisite environment are considered different domains/sites and you need to purchase separate licenses for each domain/site where you use LayerSlider. The only exception is when you are not running different sites and purely use subdomains for localization or special landing pages within the same site. As mentioned above, you can also use your purchase code to activate up to 3 additional installations in case of a development environment. Which license should I buy? The below summary covers most use cases, but make sure to read the exact licensing terms and check out Envato's License FAQ to fully understand licensing. Purchasing the Item for personal purposes, without using it commercially. Webshops and ads on your site is not considered commercial use, see details below. As a freelancer/agency buying the Item on your client's behalf with the intended use of the previous point. The Item is used for preview/advertisement purposes and it is not actually part of the larger work that you sale. The Item is part of a larger work for sale (e.g. a WordPress theme with the Item included). Offering commercial services where the Item is available for paying users. See the details below. What is considered to be commercial use? You are using the Item in a larger work for sale (e.g. WordPress theme). You are offering services where customers have to pay to access/view the Item. Check our Envato's Licensing FAQs for more details, they have examples for almost every scenarios. Again, make sure to read the exact licensing terms and check out Envato's License FAQ to avoid breaching our licenses. In general: you are not allowed to re-distribute or otherwise share the Item, even if you heavily modify it. You cannot extract and use components of the Item in your products that you plan to sell or distribute to masses in any way. Any derivative works are also subject to the terms of the licenses. Is there a developer / multi-use license? Sadly, there is not. Envato – the operator of the Market – does not offer any multi-use / developer license yet. We are an exclusive author, we cannot do business behind Envato, thus we cannot offer you any special deals. However, if you're considering buying a large amount of licenses, Envato might provide you a discount and make your purchase much easier and seamless. Make sure to contact them and ask their assistance. Can I include your Item in my work (e.g. in a WordPress theme)? You can if you're a ThemeForest author developing a WordPress theme and has In-Stock permission. Please read our exact terms before you include one of our products in your theme, as breaching those rules can terminate our agreement. Can I re-distribute your Items for other platforms or with my modifications? You cannot re-distribute or make our Items available in any form, even if you modify them. You can't use a subset of our works either, derivative works are also subject to the license terms. Please read the "Things you cannot do with an Item" section of this FAQ for more information. However, we can team up and work together in a cooperation if you have a nice idea. In this case, we would like to hear from you. For personal use only, you can modify the plugin and use it in a way you want as long as it complies with the license terms. The Item Support Policy is regulated by Envato, the operator of the marketplaces. Please refer to this article to learn more about how item support is handled. To make it short, the following summary covers the main areas you need to know. We understand that most of our customers are not programmers, that is why we will also help you with issues caused by other components (plugins, themes, etc) and we will provide you instructions to help fixing problems, even if it is not directly related to our items. However, we cannot guarantee that we will be able to fix every issue caused by faulty 3rd party components. By default, you receive 6 months of free product support from the date of your purchase. The support period can be extended by another 6 months if you purchase a support extension. Please note, the price of support extensions varies depending on when you purchase it. For the best price, make sure to opt-in for extended support when you purchase one of our products. We're providing lifetime product updates. Just by purchasing a product, you will receive every update (including major releases) for free for the lifetime of that product, even if your support period expired. We live in UTC+01:00 (Central European Time) time zone. Please keep in mind that we may have different daytime in our region compared to yours. Usually, we will respond you within 24 hours. In some edge cases (depending on the reported issue) we might need a little more time, but we are trying to be as fast as we can. We are not working on weekends, but we will try to respond you whenever we can. Where can I get help if I received the product bundled in a theme? Please refer to the Why do I need to verify my purchase? article. Make sure that you're using the latest version of the Item. Check the Item's documentation, we have troubleshooting options in each section, and a list of common issues and their solutions. Try to find a solution by searching the public tickets and support articles with the search bar above. Provide a related URL if you experience any issue, so we can see what's wrong and examine your plugin and site setup in order to find the issue. Provide a WP admin account if an issue affects the admin area and we can only see it by logging in to your site. Test incompatibility issues by temporarily disable other plugins and switch to the default WP theme, so we can rule out incompatibility issues. If this solves the problem you're experiencing, try to trace back the issue by re-enabling plugins one at a time and watching when the issue reappear again. Envato – the operator of the Market – regulates the the refund policy. Please refer to this article to learn more about how refunds are handled and how you can request a refund.